A well designed and built carport does two things. Firstly, and most importantly, it provides a place to park and protect your second most precious asset, your car. And secondly, when the car is moved, it provides a place for entertainment and relaxation. Such is the case with this carport, built by Tony Cibiras and his team at Outside Concepts Canberra Southside. With no carport or garage on the property, a structure was desperately needed to protect the family’s car. 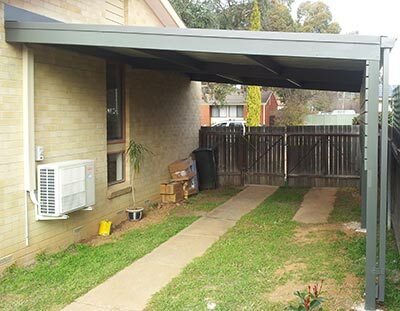 The timber and Colorbond metal roof carport more than adequately meets this need. In addition, a timber screen was installed on the neighbour’s side of the carport. While privacy and increased protection from the elements were the main reason for the screen, it also greatly lifts the attractiveness of the carport. Move the car and add a barbecue, a table and chairs and this carport soon reverts to a great place to entertain on the weekends!